Which clutch assembly is best for my vehicle? What components are in a clutch kit? How long can I expect my new clutch to last? Will an HP clutch increase my pedal effort? My clutch looks different than the stock clutch. Do I have the right clutch? Do clutches require a break in period? Can a new HP disc be purchased separately? My new throwout bearing appears to be off center on the bearing retainer and wobbles, is it defective? What parts in the clutch system/linkage should I inspect before installing a new clutch? What could cause clutch chatter? What could cause inadequate clutch release? What could cause poor shifting quality or notchy shifting? Why do all race discs come with a rigid hub or with springs? 1. Which clutch assembly is best for my vehicle? It is important to match the proper clutch system with the vehicle and its intended use! Knowing what characteristics you want in a clutch and the power capability of the engine is important. What is the vehicle used for? (Daily driving, Towing, Road racing, Drag racing, off road, Etc.)? For towing or other street use we recommend the use of a street disc for smoother engagement. For racing or off road, a race disc will give faster shifting, more power capacity and more durability at the cost of harsher engagement. What is the maximum torque output of your engine? Torque capacity listed in our application chart should be about 10-20% greater than the engine’s torque output. How heavy is the vehicle? A heavier vehicle is harder on clutch parts than a lighter vehicle. More heat is generated in the clutch getting the heavier vehicle moving. 2. What components are in a clutch kit? All clutch kits contain a pressure plate and clutch disc, release bearing and alignment tool. Pilot bearings are in selected kits that call for a pilot bearing and have it available. Kit component parts are listed on our application chart. 3. How long can I expect my new clutch to last? All clutch products are designed with longevity in mind; however, clutch life will greatly depend on the vehicle, your type of driving and output of the engine. For example a vehicle driver in heavy stop and go traffic will have a shorter clutch life than the same vehicle that is driver on the open highway. 4. Will a new clutch increase pedal effort? Our pressure plates are specifically designed to handle high torque applications. With our durable design you can expect to have an increase in pedal effort between 15-80% depending on application. 5. Is flywheel resurfacing necessary before installing a new clutch? A smooth, flat flywheel surface is essential for proper clutch operation. Flywheels are subject to heat, scoring and warping during use. If upon careful inspection there are signs of scoring, heat damage or warpage the flywheel should be resurfaced or replaced to assure good clutch performance. Resurfacing should be done on a flywheel-grinding machine only. Refer to your factory service manual or ACT information for resurfacing specifications (Flat, Step, Etc.). WARNING: IF YOUR FLYWHEEL SHOWS ANY SIGNS OF CRACKING, REPLACE IT! Never roughen the flywheel clutch surface with sanding as this reduces clutch life. The surfaces are designed to rub against each other (Producing Friction), not tear into each other (causing abrasion). 6. My clutch looks different than the previous clutch. Do I have the right parts? 7. Is it necessary to use the alignment dowel pins on my clutch? Yes! The alignment dowel pins properly locate the pressure plate to the flywheel. Without these pins severe vibration and engine damage can result. The alignment dowel pins should always be replaced if they are damaged, broken off, or missing from the flywheel. 8. What clutch bolts and torque specifications should I use? When using stock clutch bolts, refer to the manufacturer’s service manual for proper torque specifications. New bolts are highly recommended. You should using SAE Grade 8 or Metric Grade 10.9 fasteners and increasing the torque specifications (5/16 or 8mm bolts can be tightened to at least 30 ft. lbs. of torque). Lock washers or thread locking compound is also recommended. Proper torque is crucial to your safety, take the time to get the correct pressure plate assembly and flywheel bolt torque specifications and tighten the bolts correctly using a high quality torque wrench. Also be sure to tighten bolts using a diametrical pattern as indicated in your vehicle’s repair manual. Never use air tools for installing or removing clutch bolts! 9. Are new clutches balanced? Yes! All clutch assemblies are static balanced to help ensure smooth operation. 10. Is changing the pilot bearing recommended when installing a new clutch? 11. Do clutches require a break in period? For organic street discs we recommend breaking in the clutch for 200-300 miles with mild engagement such as stop and go city driving prior to racing or spirited driving. Race copper ceramic discs usually only require a few hard slips to lap in the surfaces prior to normal driving or racing. Do not overheat the clutch during the break in period. 12. Can a organic clutch disc be purchased separately? Yes our organic discs can be purchased separately, however because of the labor involved in changing a clutch we do recommend replacing the entire clutch at the same time. 13. My new throwout bearing appears to be off center on the bearing retainer and wobbles, is it defective? There is nothing wrong with the bearing. Vehicles that have a self-centering bearing may appear to be off center or improperly manufactured, however, rest assured, the bearing will align and center itself properly during normal usage. 14. What parts in the clutch system linkage should I inspect before installing a new clutch? If you are having clutch trouble prior to installing a new clutch, find the cause of the problem before installing the new clutch. There are many problems caused by worn or faulty linkage, oil contamination, and misalignment or transmission damage. Please see the installation instructions and your vehicle’s repair manual. 15. What could cause clutch chatter? Flywheel was not resurfaced or improperly resurfaced before the new clutch was installed. The use of an aggressive clutch disc designed for racing. Disc has inadequate Marcel (Not enough cushion between the friction facing.). Bent pressure plate assembly and/or disc. 16. What could cause inadequate clutch release? Flywheel not resurfaced before new clutch installed. Flywheel machined too thin or not manufactured to stock (O.E.M.) specifications. Lack of lubrication on linkage or release bearing collar. Hydraulics defective, leaking or air in the system. Clutch disc binding on input shaft, damaged splines. Clutch disc is too thick or has excessive Marcel (Too much cushion between the friction facings). 17. What could cause clutch slippage? Improper clutch adjustment, lack of freeplay. Quadrant not reset properly or is faulty (On ratchet cable type linkage systems). Clutch not fully properly seated in. Flywheel not resurfaced or surfaced improperly. Incorrect gear ratio to tire diameter. Clutch assembly has lost facing material from one or both sides of the disc. 18. What could cause poor shifting quality? Damaged disc hub (Dampers came out and interfering with pressure plate or flywheel). 19. Why do some race discs come with a rigid hub and some with springs ? 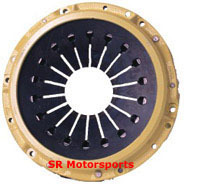 The major purpose of springs in the hub of the race clutch disc is to dampen out the torsional vibrations of the engine in order to quiet down the transmission noises under no load conditions. In racing, few people worry about noise. With the aggressive engagement of the friction materials used on the race disc chatter is a concern. Without hub dampeners you will have less chatter, faster shifting due to the lighter weight and less can go wrong.